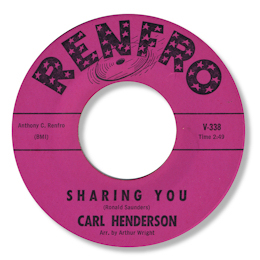 Aside from an early doo-wop group 45 on Renco from San Antonio, TX as part of the Dell Kings, Carl Henderson only recorded for Anthony Renfro in Los Angeles. His series of 45s for the tiny label, a labour of love for it’s owner for so many years, contain some first rate tracks with the slower sides sadly yet to see a legal reissue. 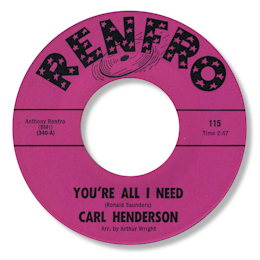 His initial release Sharing You became his – and Renfro’s – biggest seller, and what a delicious ballad it is, with a haunting melody and super subtle arrangement from Arthur “Sleepy” Wright. But best of all Carl sings it beautifully in his high baritone, with just a hint of Sam Cooke in his phrasing and featuring some thrilling falsetto. After selling a reputed 70,000 copies in Florida alone, and with the disc breaking out all over the south, Renfro did a distribution deal with A & M who put the 45 out on their Omen imprint. The flip is a very lively song with some nice bluesy touches courtesy of Wright’s guitar. For some reason the disc didn’t become the national smash it deserved, that honour going to the brilliant Mitty Collier whose cover on Chess became her own biggest seller. 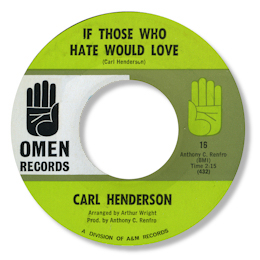 Henderson’s follow up also appeared on Omen and the self penned If Those Who Hate Would Love is another string laden beauty, but maybe not quite in the same league as his opener. This didn’t sell as well either and after this 45 all of his records would only come out on Renfro as A & M dropped out of the picture. And there were a couple of really standouts among them – both written by Roland Saunders who had penned “Sharing You” and who also had a 45 out on Renfro. Saddness (sic) is another very well constructed downbeat song with a strong Wright arrangement and a extremely well judged vocal. But for me Carl’s best ever vocal is on the wonderful You’re All I Need. This is a West Coast masterpiece that has hardly any attention for some reason. But it is a real peach – not just for the chord changes or for the lovely piano/xylophone combination that Wright sets up. Nor even for the fine horns. But for Henderson’s wonderful vocal, so soulful and with a superb sense of delay timing in his phrases. And the absence of any strings does allow a greater awareness of just what a singer he was. No wonder Anthony Renfro put it out twice – but it never went anywhere.